Every GOFeatureBehaviour.cs contains an instance of GOFeature.cs that you can use to get all the API data about the feature. (string) Name: the feature’s name. (GOFeatureKind) Kind: The feature’s kind. 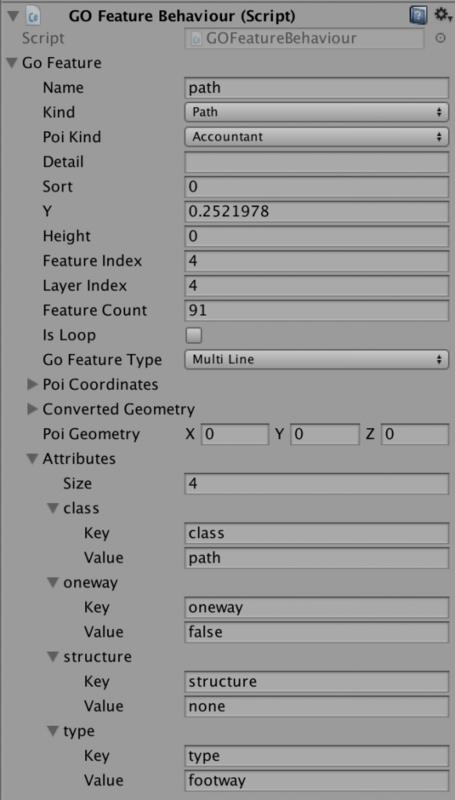 That parameter is used by GOMap to override layer’s customization. See GORenderingOption. (GOPOIKind) PoiKind: The feature’s kind if the feature is a POI. (string) Detail: Some features may have another string field that extends the kind. (sort) Sort: Sort order of this feature. (float) Y: Y value of the feature. (float) Height: the feature height (buildings only). (int) Feature Index: feature’s index in the layer’s feature list. That value is used by some APIs to sort the features. (int) Layer Index: feature’s layer index in the tile’s layer list. That value is used by some APIs to sort the features. (int) Feature Count: The number of features in the same layer. (GOFeatureType) GO Feature Type: The geometry type of the feature. (Coordinates) Poi Coordinates: The coordinates of the feature in the case it’s a POI. (List<Vector3>) Converted Geometry: The complete geometry of the feature converted in vector3. (Vector3) Poi Geometry: The geometry of the POI (point). (Dictionary<string,object>) properties: Complete list of feature’s properties. (List<KeyValue>) Attributes: List of attributes just for inspector visualization.